On Friday, we attended a polo match at Hickory Hall Polo Club. The match was a fundraiser benefiting Waldo's Muttley Crew Animal Rescue, whose mission is the rescue and placement of stray and abandoned animals. This was my first polo match, and as a life-long horse lover, I was excited to experience a new (to me) equine adventure. I've also been thinking a lot about a new dog lately, so the fact that the match benefited an animal rescue organization was an added bonus. Of course, a polo match also seemed like a good opportunity for a new outfit, but I decided that shopping in my closet was the better tack (money saved for rescuing a new puppy, perhaps?) 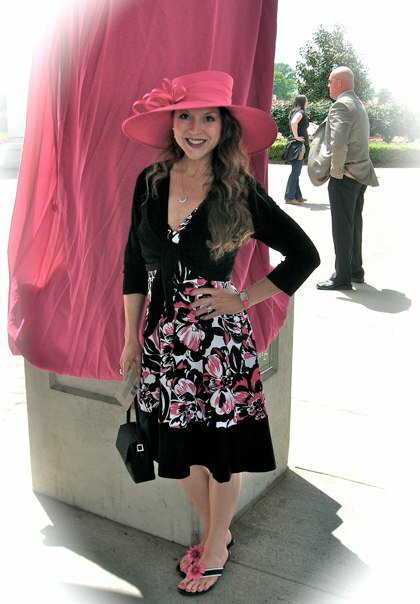 I resisted the urge to wear the brown and white polka dot "Pretty Woman" dress I wore to the Derby this year (see it here) - a little too cliche, even though I do love that dress! Anticipating the "stomping of the divots" between chukkas, however, I knew that heels were a bad idea, so I paired a pink floral sundress with my go-to outdoor summer shoes - the Lindsay Phillips switchflop, this time customized with bold bright pink flower clips. If you live in central Indiana and have an interest in polo, consider a visit to Hickory Hall - nearly all of their matches benefit local charities; you can pack a picnic and pinot to enjoy on the sidelines; and the players visit with the guests between chukkas. It's a wonderful way to get acquainted with the "sport of kings" in a friendly, accessible atmosphere. Already planning your visit? If so, you might enjoy reading "Top 8 Tips for Your First Visit to a Polo Match" and "What to Wear to a Polo Match" from the blog, That's a Pretty Hat.